A cardinal-nephew (Latin: cardinalis nepos; Italian: cardinale nipote; Spanish: valido de su tío; French: prince de fortune) is a cardinal elevated by a pope who is that cardinal's uncle, or, more generally, his relative. 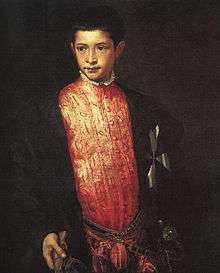 The practice of creating cardinal-nephews originated in the Middle Ages, and reached its apex during the 16th and 17th centuries. The word nepotism originally referred specifically to this practice, when it appeared in the English language about 1669. 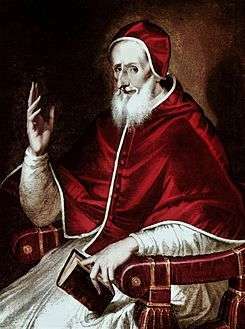 From the middle of the Avignon Papacy (1309–1377) until Pope Innocent XII's anti-nepotism bull (a papal charter), Romanum decet pontificem (1692), a pope without a cardinal-nephew was the exception to the rule. 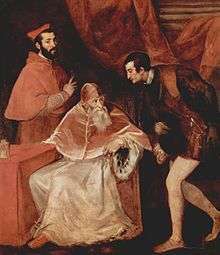 Every Renaissance pope who created cardinals appointed a relative to the College of Cardinals, and the nephew was the most common choice, although one of Alexander VI's creations was his own son. ↑ Cardinale, Hyginus Eugene. 1976. The Holy See and the International Order. Maclean-Hunter Press. p. 133. ↑ Burckhardt, Jacob, and Middlemore, Samuel George Chetwynd. 1892. The Civilisation of the Renaissance in Italy. Sonnenschein. p. 107. 1 2 Signorotto and Visceglia, 2002, p. 114. Modern French scholarly literature uses the term "cardinal-neveu". 1 2 3 Bunson, Matthew. 1995. "Cardinal Nephew". The Pope Encyclopedia. Crown Trade Paperbacks. ISBN 0-517-88256-6. ↑ Oxford English Dictionary has, as its first citation, Pepys' writing about a family reading of Gregorio Leti's Il Nipotismo di Roma, or, The History of the Popes Nephews: from the time of Sixtus IV, anno 1471, to the death of the late Pope Alexander VII, anno 1667. September 2003. 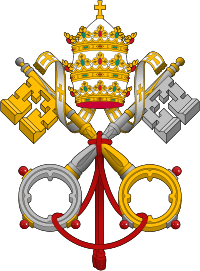 "Nepotism"
↑ Until Innocent XII, the only other exceptions were popes who did not appoint cardinals: Pius III, Marcellus II, Urban VII, Leo XI) and Adrian VI (who appointed one cardinal). ↑ Vidmar, John. 2005. The Catholic Church Through The Ages: A History. Paulist Press. ISBN 0-8091-4234-1. p. 170. 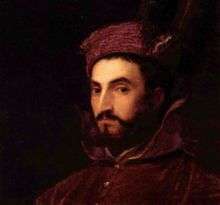 Vidmar gives the exception of Nicholas V, who elevated his half-brother Filippo Calandrini on December 20, 1448 (see: Salvator, 1998, "15th Century (1404–1503)"). ↑ S. Miranda: Consistory of 1127, citing some older authors such as Alphonsus Ciacconius, says that Pope Anastasius IV (Corrado della Suburra) was probably a nephew of his elevator Honorius II; however, modern scholars (Brixius, p. 36 and 78; Klewitz, p. 128; Hüls, p. 128 and 201; Zenker, pp. 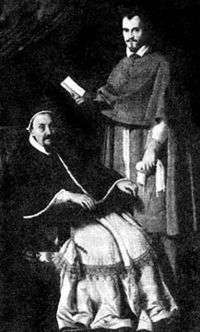 46–48) are in agreement that Corrado was created cardinal by Paschalis II, and deny or do not mention his relationship with Honorius II. 1 2 3 Miranda, Salvator. 1998. "General list of Cardinals: 11th Century (999–1099)". ↑ For the discussion concerning dubious cases see List of cardinal-nephews. ↑ Bargrave, John, edited by James Craigie Robertson, 1867. 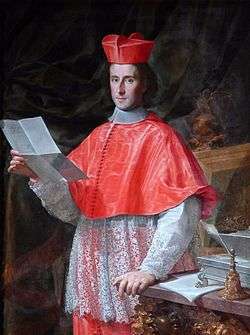 Pope Alexander the Seventh and the College of Cardinals. Camden Society. p. 3. ↑ Burke-Young, Francis A. 1998. "The election of Pope Paul II (1464)". 1 2 3 4 5 6 7 8 9 10 Reinhard, Wolfgang, Levillain, ed., 2002. "Nepotism", p. 1031–1033. ↑ Setton, 1984, p. 639. ↑ Setton, 1984, p. 711. ↑ Chadwick, 1981, p. 289. 1 2 Ekelund et al., 2004, p. 702. 1 2 3 4 5 Laurain-Portemer, Madeleine, Levillain, ed., 2002. "Superintendent of the Ecclesiastical State", p. 1467–1469. ↑ Signorotto and Visceglia, 2002, p. 141. 1 2 3 4 Herbermann, Charles, ed. (1913). "Roman Curia". Catholic Encyclopedia. New York: Robert Appleton Company. 1 2 Herbermann, Charles, ed. (1913). 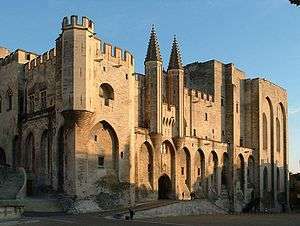 "Avignon". Catholic Encyclopedia. New York: Robert Appleton Company. 1 2 3 Hsia, 2005, p. 102. 1 2 3 Pirie, Valérie. 1965. "The Triple Crown: An Account of the Papal Conclaves: Preliminary Chapter". Spring Books. 1 2 Signorotto and Visceglia, 2002, p. 144. ↑ Bireley, Robert. 2004. Book Review of Bürokratie und Nepotismus unter Paul V. (1605–1621): Studien zur frühneuzeitlichen Mikropolitik in Rom by Birgit Emich. The Catholic Historical Review. 90, 1: 127–129. ↑ Osheim, Duane J. "Review of Kardinal Scipione Borghese, 1605–1633: Vermögen, Finanzen und sozialer Aufstieg eines Papstnepoten". The American Historical Review. 90, 4: 971–972. ↑ Baumgartner, 2003, p. 142. ↑ Tizon-Germe, Anne-Cécile, Levillain, ed., 2002, "Gregory XIV", p. 666. ↑ Signorotto and Visceglia, 2002, p. 144–145. ↑ Williams, 2004, p. 103. ↑ von Rankle, Leopold. 1848. The History of the Popes. p. 307. ↑ Herbermann, Charles, ed. (1913). 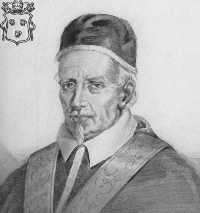 "Pope Urban VIII". Catholic Encyclopedia. New York: Robert Appleton Company. 1 2 3 4 5 6 7 Chadwick, 1981, p. 305. ↑ Herbermann, Charles, ed. (1913). "Pope Clement X". Catholic Encyclopedia. New York: Robert Appleton Company. ↑ Chadwick, 1981, p. 303. 1 2 Boutry, Philippe, Levillain, ed., 2002, "Innocent X", p. 801–802. 1 2 Baumgartner, 2003, p. 130. 1 2 Chadwick, 1981, p. 304. 1 2 Rosa, Mario, Levillain, ed., 2002, "Curia", p. 468. ↑ Fr. Jeffrey Keyes. "A YOUNG MAN IN THE ROME OF PIUS VII Archived September 30, 2007, at the Wayback Machine.". p. 34. 1 2 Standen, Edith A. 1981. "Tapestries for a Cardinal-Nephew: A Roman Set Illustrating Tasso's "Gerusalemme Liberata". Metropolitan Museum Journal. 16: 147–164. ↑ Hansman, Silvia. 1999, Spring. "The Vatican Secret Archives". Seminar on Records and Archives in Society. 1 2 Chadwick, 1981, p. 299. ↑ Signorotto and Visceglia, 2002, p. 142. 1 2 Wilcock, John. 2005. "Popes and Anti-Popes". ↑ Duffy, Eamon. 2006. "Saints & sinners: a history of the Popes". ↑ Pirie, Valérie. 1965. 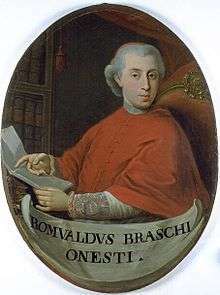 "The Triple Crown: An Account of the Papal Conclaves: XVIIIth Century: PIUS VI (BRASCHI)". Spring Books. ↑ Pirie, Valérie. 1965. "The Triple Crown: An Account of the Papal Conclaves: XIXth Century". Spring Books. p. 305. ↑ Miranda, Salvador. 1998. "Consistory of February 1, 1836 (VIII)". 1 2 Baumgartner, 2003, p. 151. ↑ Baumgartner, 2003, p. 145. 1 2 Baumgartner, 2003, p. 143. ↑ Baumgartner, 2003, p. 155. ↑ Signorotto and Visceglia, 2002, p. 93. ↑ Signorotto and Visceglia, 2002, p. 121. ↑ Baumgartner, 2003, p. 150. 1 2 Trollope, 1876, p. 138. ↑ Miranda, S. 1998. "Consistory of September 28, 1500 (IX)". Florida International University. ↑ Miranda, S. 1998. "Consistory of June 7, 1555 (I)". Florida International University. ↑ Baumgartner, 2003, p. 141. ↑ Baumgartner, 2003, p. 152. ↑ Chadwick, 1981, p. 301. ↑ Chadwick, 1981, p. 302. ↑ Hsia, 2005, p. 103. ↑ Ambrosini, Maria Luisa, and Willis, Mary. 1996. The Secret Archives of the Vatican. Barnes & Noble Publishing. ISBN 0-7607-0125-3. p. 138. ↑ Burkle-Young, Francis. 1998. "The Cardinals of the Holy Roman Church: Papal elections in the Fifteenth Century: The election of Pope Eugenius IV (1431)." ↑ Setton, 1984, p. 912. 1 2 Baumgartner, 2003, p. 166. Ekelund, Robert B., Jr., Herbert, Robert F., and Tollison, Robert D. 2004, October. "The Economics of the Counter-Reformation: Incumbent-Firm reaction to market entry". Economic Inquiry. 42, 4. 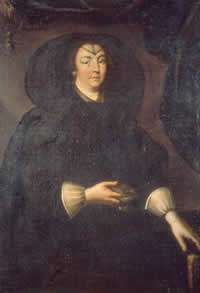 Leti, Gregorio (1669). William Aglionby, tr., ed. Il Nipotismo Di Roma; Or, the History of the Popes' Nephews from the Times of Sixtus the IV. to the Death of the Last Pope, Alexander the VII. ... Written Originally in Italian [by Gregorio Leti] in the Year 1667, and Englished by W.A. London: John Starkey.